The Government of China considers its number of executions a state secret. According to Amnesty International, between 1995 and 1999, a total of 8401 Chinese citizens were sentenced to death, giving an annual average of 1,680. Between 2000 and 2005, it was 1616 per year. 1970 The numbers have fluctuated from year to year, but the overall average number for the periods remained the same before and after the persecution of Falun Gong began. Between 2006 and 2008, the average was 1,066, 1971 1972 1973 an indication of fewer executions. Amnesty International stopped reporting the number of executions in China in 2009. Other organizations, such as Duihua Foundation, gave estimates similar to what Amnesty International attributed to credible sources. 1975 Duihua calculated its total by extrapolation from the death penalty case load of individual Chinese legal practitioners. To meet transplantation standards, sources must not have these diseases or conditions: fatty liver, hepatitis, cancer, infections, diabetes, history of cardiovascular disease, HIV antibodies, syphilis antibodies; high blood pressure, heart disease, tuberculosis, or history of liver or kidney disease. In addition, one out of ten people in mainland China carry the hepatitis B virus.1978 The percentage is much higher in the prison population. The percentage of death row prisoners who would qualify as organ sources is low. Thus, the number of annual liver and kidney transplants performed by just one hospital far exceeds the Amnesty International calculation of the number of executed prisoners nationwide. Because of the high volume of organ transplants performed in China since the rapid growth began in 2000, the claim that all or most transplant organs came from executed prisoners is contradicted by the total number of transplants performed. 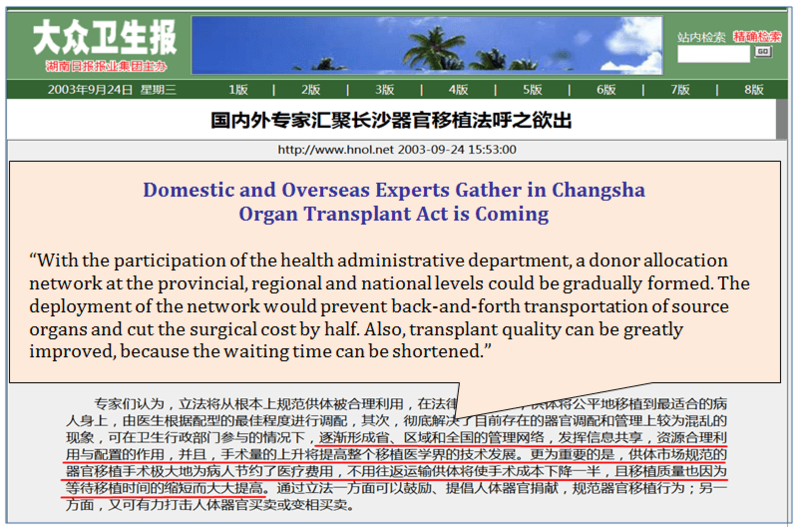 In December 2014, China state-owned media declared that from January 1, 2015 onwards, China would stop using executed prisoners’ organs for transplants, and that citizens’ voluntary organ donations after death would be the only source for organ transplants.1984 This announcement was made by Huang Jiefu, former Deputy Minister of Health and now director of the Chinese Human Organ Donation and Transplantation Commission. In March 2010, China piloted an organ donation program in Shanghai, Tianjin, Liaoning, Shandong, Zhejiang, Guangdong, Jiangxi, Fujian, Xiamen, Nanjing, Wuhan, and eventually in 19 provinces and cities.1988 This program was jointly run by the Ministry of Health and China Red Cross. On December 6, 2015, the staff at the Red Cross Society of Beijing confirmed that organ donation was still in the preparatory stage. The Beijing Red Cross did not even have a donation office at the time and had not yet arranged a single case of organ donation.2001 Yet there are 20 state-approved transplant centers in Beijing, many of them with the capacity to carry out thousands of transplants per year. On December 17, 2015, a female staff member at the Shanghai Red Cross organ donation office in Huangpu District reported that her office had begun carrying out donation work at the beginning of the previous year and that the city of Shanghai claimed 5 successful organ donations since the donation system began.2002 Yet there are 11 hospitals in Shanghai which have state approval to carry out organ transplants and all of them are capable of carrying out a large volume of transplants. On December 12, 2015, a Tianjin Red Cross worker reported that since an organ donation database was created in 2003, there had been a total of 170 donated organs.2003 Yet Tianjin’s Oriental Organ Transplant Center has over 500 transplant beds and is estimated to have an annual capacity of at least 5,000 transplants. To date, these issues have not yet seen substantive changes or improvements. In recent years, official state media have reported a few high-profile cases of individual human organ sales.2009 The number of such reported transactions remains miniscule. The New York Times reported on April 6, 2016 that donation coordinator Cao Yanfang of the Zhejiang Province Human Organ Donation Management Center said that 2,766 people donated 7,785 organs in 2015 and that there were 66,000 donors on the state registry. Those aggregate figures, like the aggregate figures for transplants in general, conflict with individual figures. For transplants performed, looking at individual hospitals bring us to volumes far larger than the official aggregates. For organ donations, by looking at individual donation centers, we get figures far smaller than the official aggregates. A second explanation for the discrepancy between overall donation figures and the aggregate of what individual donation centres report is that Chinese hospitals are buying from impoverished family members of patients near death, who consent to the harvesting of organs from their loved ones. What health officials now call a donation system is, for the most part, a purchase and sale system with hospitals as brokers. Patients pay large sums for organs. The families of potential donors near death are offered large sums for their consent. There is a second discrepancy at play here–the difference between total transplants and total organs donated, no matter how inaccurately the term “donation” is used. The official Chinese line is that all transplants come from donations. Yet, total transplants, if one aggregates the work of individual hospitals, far exceeds the figure of 7,785 reported in April 2016 for 2015. There are two transplant systems running in China: a system however inappropriately described as a donation system, and a system outside the donation system. The donation system collects those few donations which really are voluntary, prisoner organs funneled through the donation system, and the organs of dying patients bought with the consent of their families. The non-donation system, which towers over the donation system, account for the bulk of organ transplants in China. The medical field began to conduct human organ transplantation in the 1960s. There has been a tremendous development in China’s human organ transplant industry after 1999. The timing of this growth corresponds to that of the Chinese Communist Party’s persecution campaign against Falun Gong. Our books, Bloody Harvest: Organ Harvesting of Falun Gong Practitioners in China and The Slaughter: Mass Killings, Organ Harvesting, and China’s Secret Solution to Its Dissident Problem, have discussed transplant growth in China in detail and concluded that Falun Gong practitioners are the main victims targeted by the large-scale live organ transplant industry in China. Since the very beginning of the persecution, Falun Gong practitioners appealed to government departments in their provinces, in the Beijing appeals office, or at Tiananmen Square. The number of people petitioning the government in Beijing was at its highest between the beginning of 2000 and the end of 2001. The U.S. Congressional Executive Committee on China’s annual report for 20082028 noted that international observers believed that half of those incarcerated in China’s forced labour camps were Falun Gong practitioners. Ethan Gutmann estimates that Falun Gong constituted about half of the laogai system in 2001 and then leveled off to 15 to 20% over the long term, translating to about 500,000 to 1,000,000 Falun Gong practitioners being detained in the laogai system at any given time. Many detention centres were built or expanded all over China to house the large number of Falun Gong practitioners who were arrested and detained. The Chinese Communist Party also made use of military and underground civil defense facilities to establish holding units for Falun Gong practitioners.2029 These practitioners have disappeared, both legally and practically. 3) the families have given consent. Although the law may not have been originally conceived with a specific loophole in mind, it did allow organs from prisoners to be used without their consent and also without the consent of their family, as long as the body was not collected. The law does not require a prisoner to be sentenced to death and then executed for his or her organs to be used. In the case of Falun Gong, the authorities also used the “Provisional Regulations” to prevent the families of the dead practitioners from claiming their bodies, which in turn facilitated forced organ harvesting and the unlawful sale of bodies. The authorities do not necessarily inform family members when a Falun Gong practitioner is arbitrarily detained in a “re-education through labour” camp. Moreover, many detained Falun Gong practitioners, in order to protect their family, friends, work colleagues and neighbors, do not self-identify once detained. For the non-self-identified, the authorities do not know who the family members are and cannot notify them. This combination of Chinese legal factors allows for the sourcing of organs from Falun Gong practitioners without either their consent or the consent of their family members, and whether or not they have been sentenced to death. Moreover, the numbers subject to this license to harvest organs is large, because of the large numbers of non-self-identified Falun Gong practitioners in detention. In detention centres, Falun Gong practitioners are frequently given blood tests and medical examinations, while other prisoners (with the exception of Uyghurs, Tibetans and certain House Christian groups who were also targeted) receive no such treatment. During the investigation, Ethan Gutmann interviewed over 50 Falun Gong practitioners who had been detained in labour camps and prisons in China, many of whom were forcibly given blood tests and unusual examinations. Many similar cases were recorded in Matas’ and Kilgour’s Bloody Harvest. The website Minghui.org publishes many firsthand accounts of Falun Gong practitioners all over China who had gone through such examinations. Cases of practitioners’ bodies being cremated without the consent of their families continue to be reported on Minghui.org. Hundreds of thousands of Falun Gong practitioners have been displaced or have gone missing. Given that this proposal was being made a full decade before an organ donation system was established in China, Huang Jiefu must have been referring to organs from prisoners. The website Minghui.org publishes many firsthand accounts of Falun Gong practitioners all over China who had gone through such transfers. The 610 Office is the main organization created by the Communist Party to eliminate Falun Gong. It is nominally subordinate to the Political and Legal Affairs Committee. The Committee’s purview was expanded after the 610 Office was incorporated into it. 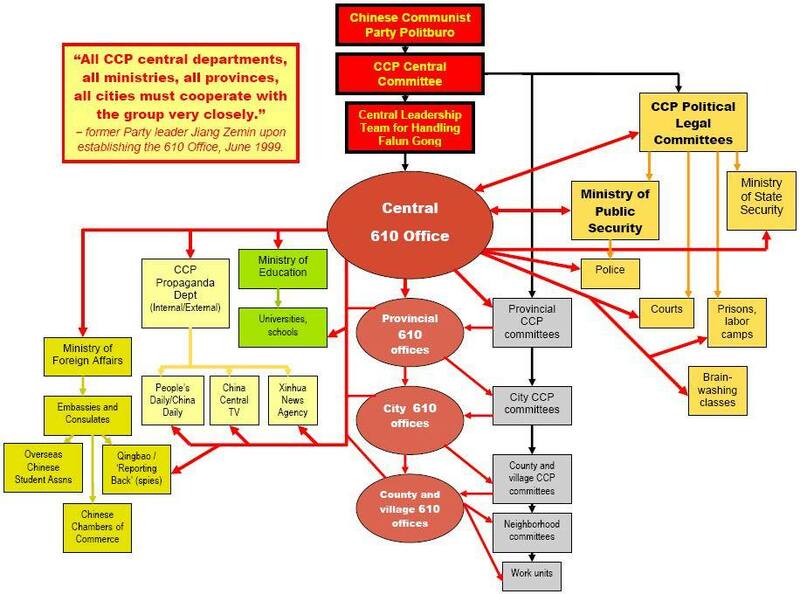 The Committee and, in consequence, the 610 office, oversees the public security bureau, the procuratorate, and judicial systems. A propaganda campaign has been a key tool in the suppression of Falun Gong. Since the persecution began in July 1999, the 610 Office has used the country’s newspapers, television stations, radio stations, websites, and loudspeakers in rural areas to broadcast anti-Falun Gong propaganda. It also has used Xinhua News Agency, China News Service, China News Agency, Party-controlled media overseas, and Chinese consulates to spread this propaganda globally. Zhou made the capture and repression of Falun Gong a major focus of domestic security work in China. During his tenure the quantity of transplants taking place in China – sourced from Falun Gong – continued to grow rapidly. Judicial systems sold organs to the transplant centres. Forensic hospitals actively conducted organ transplant. Special institutions under Public Security Bureaus, such as, Wang Lijun’s Jinzhou and Chongqing Public Security Bureau On-Site Psychology Research Centres, carried out organ transplantation and human body experiments on a large scale. During the Communist Party’s 17th National Congress in October 2007, Zhou Yongkang replaced Luo Gan as the Party Secretary of the Political and Legal Affairs Committee. Zhou became head of the “Central leading group to handle the Falun Gong issue” and was placed on the Party’s highest strategic tier—the Politburo Standing Committee. At the end of 2013, the new Chinese Communist Party leadership removed Zhou Yongkang under charges of corruption and plotting to stage a coup. But the machinery of the Falun Gong persecution has not stopped. These agencies centrally coordinate and guide the Chinese organ transplantation systems: procurement and allocation, clinical care and services, post-operative registration, oversight, and donation. These agencies also organize and implement training and sharing in the regulations, policies, and techniques for transplantation. In particular, they evaluate the qualifications of the transplant institutions, as well as the capabilities and management of clinical practices. They also grant and manage permits to the qualified transplant centres. Since organ transplantation has been made a high priority in the Chinese Communist Party’s national strategy and heavily emphasized as a future emerging industry, a large number of organ transplant projects have been funded under major national programs. The Ministry of Health, the Ministry of Science and Technology, the Ministry of Education, other departments, and the military have invested heavily in research, development, and personnel training in transplantation technology to meet the needs of this rapidly-growing industry. New capabilities and techniques have emerged and been extensively spreading, allowing live organ transplantation in China to grow into a large, industrialized operation in less than two decades. In March 2013, at the Twelfth National People’s Congress, the former Ministry of Health and the National Population and Family Planning Commission were dissolved, and Huang Jiefu was relieved from his position as Deputy Minister of Health. Meanwhile, a new National Health and Family Planning Commission was founded.2044 Huang Jiefu served as chairman of the China Organ Transplant Board. He was the chief editor of 11 surgery monographs and participated in the editing of 5 surgery monographs.2045 On March 1, 2014, China Human Organ Donation and Transplantation Commission announced its establishment. It declared that, under the leadership of the National Health and Family Planning Commission and the China Red Cross Society, the Commission would work as a central management unit to guide and oversee the human organ transplant and donation system in China. Huang Jiefu was named the Commission’s director.2046 Since then, Huang Jiefu has been the spokesperson for China in the field of organ transplantation. Huang’s new title, director of the Chinese Human Organ Donation and Transplant Committee,2047 is not an official designation, according to Communist Party personnel information. The news section of the official Chinese Communist Party leadership repository lists Huang’s titles as “former Deputy Minister of Health” and “deputy director of the Central Health Committee.”2048 It is also germane that on the website of the National Health and Family Planning Commission the “Chinese Human Organ Donation and Transplantation Commission” established in 2014 is not listed under any departmental structure. 2049 Even though described as the central management agency for transplantation in China, the agency does not have an official website. It was announced at the inaugural meeting that its secretariat belongs to the National Health and Family Planning Commission. The Transplantation Commission appears to be a shell organization with no dedicated personnel or offices. The People’s Liberation Army is controlled by the Chinese Communist Party and is one of the few militaries in the world that belong to a party rather than the State. It is a tool used to sustain the Chinese Communist Party’s control over China. From 1999 to May 2006, the Chinese Communist Party Central Military Commission held six special meetings on “handling foreign-related religious issues,” which mainly targeted Falun Gong.2052 The General Logistics Department was authorized as the core unit to lead every level of the military to eradicate the practice of Falun Gong including the power to manage the secret detention facilities and the process of live organ harvesting. According to an investigation by the World Organization to Investigate the Persecution of Falun Gong, over 100 different military hospitals have developed or expanded their organ transplant facilities, with over 2,000 medical personnel involved.2053 These include military general hospitals which belong directly to the Central Military Commission, all military branch general hospitals, general hospitals which belong to the seven regional military commands, hospitals affiliated with military medical universities, military hospitals coded with numbers, and armed police general hospitals. The transplant volume performed by Chinese military hospitals is the largest of any military in the world. They also play a role in resolving core technical issues in organ transplantation and supporting civilian hospitals with living organ supplies and technical assistance. What distinguishes the whistleblowers we highlight in this section is that they know much more about the entire landscape of organ harvesting than these other whistleblowers did. They are also harder to vet. In the case of the first three witnesses below, they are only slightly better than anonymous electronic communications. In the case of the investigative phone calls set out after the first three below, the situation is better; the calls were recorded, the officials are known, and one could theoretically match the voice signatures. The hospital has a capacity of 800 beds. It has over 300 senior technical personnel, 44 doctoral and graduate advisors, and more than 90 part-time professors from Shandong University. These faculty members have clinical teaching responsibilities in not only Shandong University’s clinical medical school, but also Shandong University of Traditional Chinese Medicine, Weifang Medical College, Taishan Medical College, Binzhou Medical College, Shandong Province Nursing School, and other institutions. In 2014 and 2015, Yang Guang, a China expert who resides in Denmark, reported to the Epoch Times and New Tang Dynasty Television about two of his friends. One of his friends was a vice president of a medical university in northeastern China, in charge of logistics for its two affiliated hospitals. Before 2009, he was put in charge of the two hospitals, each of which conducted 2,000 to 3,000 organ transplants every year. The real name and former workplaces of Mr. Yang’s first friend were verifiable online. There was no attempt to contact the witness, because of the dangers to which the contact would expose him. The hospitals’ and witness’s names are redacted for safety concerns. The vice president added, the actual death row prisoners, criminals who had been sentenced to death account for only a small number of the organs procured. 2063 Even in the ten biggest cities in China, no more than fifty prisoners were executed annually. Senior Chinese Communist Party officials and their relatives refuse to accept organs from executed prisoners. Those organs were usually reserved for foreigners who come to China for organ transplants. Prices for foreigners are not fixed—in some cases, those with money, desperate for an organ, have been charged up to $2 million for a transplantation and hospital stay. Since Anne made her public statement about live organ harvesting in March 2006, the World Organization to Investigate the Persecution of Falun Gong has documented more than 2,000 recorded phone interviews with members of the judiciary, military, armed police, and organ transplant centres in 31 provinces, municipalities directly under central government and autonomous regions. The targets of investigation include members of the Politburo and the Politburo Standing Committee, the Vice Chairman of the Chinese Communist Party Central Military Commission, a CMC member and former defense minister, a former head of the People’s Liberation Army General Logistics Department’s Health Division, members of central and local Political and Legal Affairs Committees, agents of the 610 Office, transplant doctors in military and civilian hospitals all over China, and an organ broker. Chen: How to identify a Falun Gong practitioner? Well, when the time comes, then our side, our boss will have people showing you information, you know. He will show you the information and data. You can be sure. We have connections with government officials. There are connections to high ranking officials. You know, I will show you such material even if you don’t ask me for it. Investigator: I heard from others that, several years ago, the Falun Gong practitioners did not disclose their names after they were taken away. There are quite many who belong to this type. Some were kept in the basement, and some are detained in neither prison nor forced labour camps. Chen: Yes, this is quite normal. If Falun Gong practitioners did not give their names, they would be given a code. If their names couldn’t be identified, there would be their code numbers. Also, one can be tracked by fingerprints. That’s how the source can be tracked. Nowadays in our society, especially for these types of matters…like our boss, like the connections to the detention centres, I cannot tell you. For situations like what you said, I cannot say casually. We have close relationships with them. Since we are engaging in this business, we have our people in each and every department. How can you get things done if we don’t have our connections? This thing is just like a supply line, you know? On September 30th, 2014, Bai Shuzhong,2066 former head of the People’s Liberation Army General Logistics Department Health Division, spoke to a World Organization to Investigate Persecution of Falun Gong investigator who assumed the identity of a Party investigator and proceeded to ask Bai pointed questions about living organ harvesting. Bai served from 1998 to 2004, and, as the top officer leading core institutions of the military health system, he would have been the main person responsible for conveying instructions to implement policy. Investigator: We also obtained some intelligence, that is to say back then, the Joint Logistics Departments [of the Military Regions] had detained a number of Falun Gong people as “live organs”. Is that true? Investigator: You guys [the People’s Liberation Army General Logistics Department] and the Joint Logistics Department No. 1, Joint Logistics Department No. 2, including the Joint Logistics Department No. 40 subdivision, and the military hospitals they were in charge of, do you have a supervisory relationship with them? From May 4 to May 10, 2012, Liang Guanglie, former Secretary of Defense, former People’s Liberation Army Chief of Staff, and member of the Central Military Commission, was investigated by the World Organization to Investigate the Persecution of Falun Gong during a visit to the U.S. The investigator had assumed the identity of a member of special group investigating Wang Lijun. Regarding the Grade 3A military hospitals using Falun Gong practitioners’ organs for transplants, Liang replied, “I’ve heard about it …I did not take care of that thing. I was in charge of military affairs, instead of the logistics and medically related [affairs].” When asked about this, he stated that “it was discussed” during the Central Military Commission meeting. This is a story which begins in mystery and ends in mass murder. From where do all the organs for transplants come in China? China, for most of its transplant history, did not have a donation system at all. China now has a donation system which produces almost no donations, so that is not the answer. Because of the availability of organs with short waiting times and the absence of a law sourcing organs from brain dead cardiac alive patients, the answer is not accident victims. Because of disease in the prison population, the need for blood type compatibility, a law which requires execution seven days after the sentence, and the decreasing number of persons sentenced to death, the answer, for the most part, is not death penalty criminals. So what is the answer? The answer is mostly innocents, prisoners of conscience, Tibetans, Uyghurs, select House Christians and, most of all, Falun Gong practitioners. What is driving this mass murder? Is it the Chinese Communist Party and its abhorrence of Falun Gong? Or is it the demand for organs and needs of the health system, particularly the military hospitals, for funding? Did the Party lead the health system in these mass killings, or did the health system take advantage of a vulnerable population that the Party had made available for exploitation? The constitution of China refers to “the Chinese people of all nationalities led by the Chinese Communist Party” or “under the leadership of the Chinese Communist Party” six different times. When something occurs in China as systematic and widespread and in such great numbers as the killing of Falun Gong for their organs, it is a denial of the reality of China to ascribe leadership to anything but the Chinese Communist Party. When the Chinese Communist Party issues an order that Falun Gong must be physically destroyed, as it has done, it is not too big a leap to conclude that the Communist Party has ordered that Falun Gong be physically destroyed through organ harvesting. This explanation concludes that the large-scale organ harvesting from Falun Gong practitioners was directly ordered by the Standing Committee of the Party and implemented by both military and civilian institutions. Through various levels of the 610 Office, the Party established a unified chain of operations to enable harvesting of organs on demand. The People’s Liberation Army General Logistics Department has served as the core operations unit, with cooperation from other military units, armed police, Political and Legal Affairs Committee at different levels, the medical system, and organ brokers. Through this chain of operations, practitioners arrested when petitioning in Beijing and those detained across the country were forced to undergo blood tests and other medical examinations. The results were registered in a database of living organ sources to enable quick tissue matching for allocation. The People’s Liberation Army General Logistics Department operates in a centralized and secretive mode, allocating detention facilities, distribution, transportation, delivery, security, and accounting of supplied organs.2072 Under the direction of the Chinese Communist Party’s leadership, led by the military, organized and driven first by the Ministry of Health and later by its successor, the National Health and Family Planning Commission, China’s transplant centres grew rapidly. The alternative is that the Party passively acquiesced to mass killings led by the transplant profession and the hospitals in search of funding and, perversely, reputation, and by patients who did not care who was killed as long as they could live. Greed, selfishness and institutional demands drove the health system to pillage the organs of a marginalized, dehumanized minority. The large sums patients paid for organs went not just to medical personnel and hospitals, but also, in part, to prison, labour camp and detention centre guards who handed over Falun Gong detainees. Corruption has become pervasive in China, and the killing of Falun Gong for their organs is one aspect of it. The massive organ supply available from Falun Gong practitioners was, to hospitals and transplant professionals, an opportunity. Hospitals grasped the opportunity. They innovated continuously in transplant capabilities and technology. The innovations became standardized and shared among the hospitals. Within a few years, liver and kidney transplants became routine clinical surgery. Organ transplantation techniques and volume increased rapidly. National level transplant centres popularized their clinical technology throughout the country, trained a large number of transplant doctors, and led the exponential growth of China’s transplant industry. A third explanation is a synthesis of the previous two. The Communist Party’s demonization and brutalization of Falun Gong and the health system’s insatiable demand for organs have lived in China in symbiosis. Each feeds off the other. The combination is a human rights and humanitarian disaster. Before 2000, the technology in kidney and liver transplants had matured through the sourcing of organs from prisoners sentenced to death and prisoners of conscience. The repression of Falun Gong opened up a mass organ supply. If the Chinese Communist Party had not approved and supported the mass killing of Falun Gong for their organs, it would not have been possible for the transplant profession and the hospitals to participate in and benefit from these killings. Unless transplant professionals and hospitals were motivated for their own reasons to transplant organs without regard to their source, a Party-driven policy of killing Falun Gong for their organs would have not gone very far. As noted earlier incentives to growth in transplant volume are supported by the Party’s national strategic planning. Since 2001, the Party has incorporated organ transplantation into its Five-Year Plans. Reporter: Minister Huang, have you ever taken organs from executed prisoners? Huang: I said I went there once, but I was not the one who did the extraction. But after that one time, I did not want to go again. I am a doctor. Doctor has a moral bottom line, which is respecting life and helping the sick. This must be done in sacred places. Otherwise, it is against the moral bottom line of a doctor. Reporter: Do you remember which year it was? Reporter: Was that the first year you did a human organ transplant? Huang: First year. Because organ transplant is divided into two teams. One is the organ team, who extracts the organs. One is the recipient team, who transplants the organs. Huang: I am in the recipient team. I’ve never been in the organ team. But I did go once to see how they do it. So, I have only been there once. After that time, I never wanted to have anything to do with the organ team. But I feel that I needed to change it. Reporter: When you help the recipient, you think it is saving a life. But do you try not to think about the “organ”? Huang: The majority of the transplant surgeons feel helpless. On the one hand, you face the patient who has a failing organ. As a doctor, you have the ability and responsibility to save people. But the other side of the story, when you think about the organ source, you feel helpless. In criminal law, the term for this behavior is willful blindness. A person who commits a criminal act and is willfully blind is as guilty of a crime as a person who commits the act with full knowledge. Huang said that he felt helpless. However, he was not helpless. He could have said “no” to participating in organ transplantation using an organ from an improper source. If Huang truly “never wanted to have anything to do with the organ team,” then he could have stopped performing transplants. The notion that he has nothing to do with the organ team, when he is taking organs from the organ team, is a fantasy. If organ harvesting goes against the moral bottom line of a doctor, and in this case Huang stated that it did, then using an organ from an improper source also goes against the moral bottom line of the doctor. There is no difference in the morality of harvesting from an improper source and transplanting an organ harvested from a source which the transplanting doctor knows to be improper or to which the transplanting doctor is willfully blind. Health workers went along. The detailed testimony of the Uyghur surgeon, Dr. Enver Tohti, tells us there were professional consequences for not going along. There were lucrative benefits for cooperating. Some rationalized their behavior by claiming that they were changing the system from within. Live organ transplants from prisoners of conscience have been taking place since at least 1997. Live organ transplants of scale, and thus, from Falun Gong practitioners, have been taking place for 16 years, and counting. Although a few kingpins of harvesting such as Bo Xilai, Wang Lijun and Zhou Yongkang were arrested and jailed (using pretexts and not organ harvesting,) the reform never came. And that is a tragedy for the Chinese people. The Chinese transplant system needs to be reformed. However, such reform is difficult in its current context—an autocratic Communist state in which the abuse and torture of enemies of the state is accepted practice. Stopping the persecution of Falun Gong and other prisoners of conscience, ending the sourcing of transplants from prisoners of conscience, and bringing to justice the perpetrators of organ transplant abuse would mean changing the nature of the Chinese Communist Party. Expecting an organ transplant island of transparency and rule of law in a raging sea of tyranny, repression, cover-up, and incitement is delusional. Yet there may be a reckoning. Perhaps the Chinese people will have the opportunity judge its former leadership and its medical establishment. Once the reckoning begins, the road to justice will be lined with families, Han Chinese, Uyghurs and Tibetan, who have lost someone. China has been one of the great cradles of medical innovation, a land where solutions to problems that we think of as novel and modern, developed and thrived. As a singularly great culture, China is second to none in its ingenuity, and, over thousands of years of civilization, it was second to none in its attention to ethics. Today, that ethical spirit may be suppressed and appear to be sleeping, but the ethics and the ethical are still there. Many Chinese people aspire to moral principles. In restoring the ethical and moral baseline, there is no better place to start for both the Chinese and the international community alike than stopping the Chinese organ harvesting juggernaut. Source：The Lancet，Author: Huang Jiefu, etc. 2007 1.5 Million People in China Waiting to Die – Is China’s Low Organ Donation Rate Due to Lack of Love? By Kirk C Allison, Norbert W Paul, Michael E Shapiro, Charles Els, and Huige Li. 2054 The Slaughter pp. 17-19.